The International Inland Port of Dallas (IIPOD) is an intermo- 2017, expected to generate 3,500 new jobs in all. dal and logistics district that encompasses 7,500 acres and fve Other BNSF Certifed Sites include Ardmore, Oklahoma; municipalities. The City of Dallas Offce of Economic Develop- Avard, Oklahoma; Gallup, New Mexico, Great Falls, Montana; ment noted that the Dallas-Fort Worth area is at the confuence Greenville, Illinois; Los Lunas, New Mexico; Middletown, Iowa; of three major Class I railroad networks — Union Pacifc, BNSF Minot, North Dakota; Newton, Kansas; Shafter, California; Shel- and Kansas City Southern — and that the Dallas-Fort Worth by, Montana; Sioux Falls, South Dakota and Temple, Texas. Major manufacturing tenants at IIPOD include American Tex- zoning and entitlement, rail serviceability and proximity to tile, Pioneer Frozen Foods, Niagara Bottling and Serta Dormae. highways or interstates. 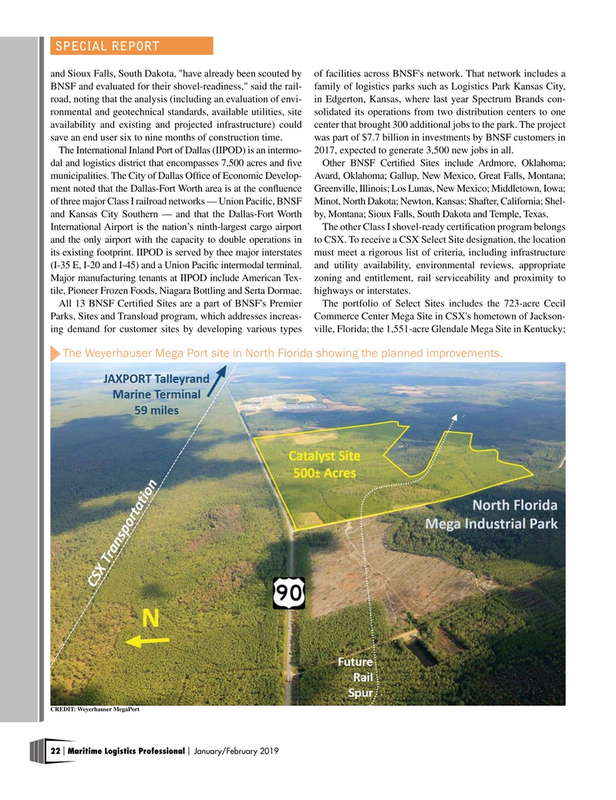 The Weyerhauser Mega Port site in North Florida showing the planned improvements.